The Gimlet is a classic cocktail with gin, lime juice and simple syrup or Rose’s sweetened lime juice. An easy summer cocktail that can be enjoyed year round. If you love this gimlet cocktail as much as I do you will be sure to try my recipes for a rhubarb sour, a lilac bee’s knees cocktail or even a lilac martini. All wonderful cocktails to have in your cocktail repertuar. What is in a gimlet? A gimlet is one part sweetened lime juice together with four parts gin. One of the most well known recipes calls for 1 1/2 ounces Rose’s lime juice with 2 ounces Gin. This is the recipe from The Bartender’s Bible by Gary Regan. Gary also calls for Plymouth gin. What’s the difference between a martini and a gimlet? While both a martini and a gimlet are made with gin, the martini is made with vermouth and is garnished with either a green olive or a lemon twist. The gimlet is made with sweetened lime juice and gin. Both drinks could be served straight up or on the rocks. Is a gimlet shaken or stirred? According to the British, a good gimlet is thoroughly stirred. Will you damage the gin or the lime juice if you shake the ingredients? Probably not. Go ahead and stir your cocktail. How do you serve a gimlet? A gimlet is serve in a cocktail glass with an inverted cone shape on a stemmed base, also known as a cocktail glass or a martini glass. It is usually served straight but can be served on the rocks if desired. Don’t forget the lime slice for garnish. What barware is needed to make this cocktail? Can a gimlet be made without Rose’s lime juice? If you do not have Rose’s lime juice you can add a simple syrup to fresh squeezed lime juice as a substitute. Can a gimlet be made with both Rose’s lime juice and fresh lime juice? Another delicious recipe uses both Rose’s sweetened lime juice and fresh lime juice. In a mixing glass filled with ice, add gin, simple syrup and lime juice or gin and Rose’s lime juice. With a bar spoon, stir the ice and cocktail ingredients for several minutes. Place a Hawthorne strainer over the mixing glass and strain the cocktail into a chilled cocktail or martini glass. Garnish with a lime slice and enjoy! 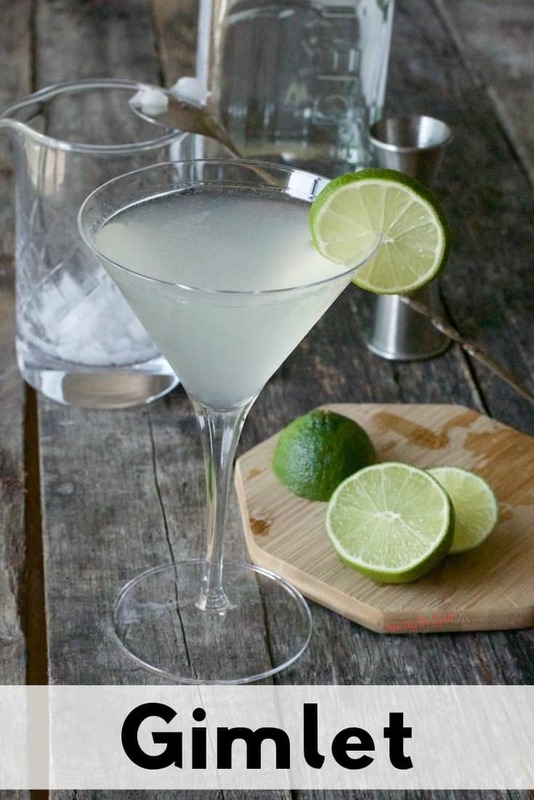 The Gimlet is a classic cocktail with gin, lime juice and simple syrup or Rose's sweetened lime juice. An easy summer cocktail that can be enjoyed year round. In a mixing glass filled with ice, add gin, simple syrup and lime juice or gin and Rose's lime juice. The perfect cocktail for the warmer weather! I agree! After I posted this I was thinking I will add a bit of basil for another version. Such a classic, delicious cocktail! I made one over the weekend and it was so delicious! Thanks for sharing! I am so glad you enjoyed it Jessica! I have a feeling the gimlet will be the cocktail of the summer at my house.